Fluide: an operating environment for extensible multiprocessors, J Skubich et al. Mapping an algebraic specification onto a modula-2-program, W Ditt. Perspectives of automatic real-time program synthesis, Z Banaszak. A knowledge-presentation for diagnosis of dynamical systems, N Kumagai et al. A framework for fault tolerant design using abstract data types, M B Kelly. Digital signal processors, H Halling. A paradigm for the development of distributed systems, G M Bull et al. Development of real-time systems: specifying functional and parallel behaviour formally, M Goedicke. Rtunix - one step towards real-time unix, T Tempelmeier. Problems of real-time scheduling, D J Leigh. Formal specification of a real-time multiprogramming kernel, J Gorski. Artex - a real-time executive for distributed process control, O Pettersen. Formal specification of real-time software systems: an industrial example, J A de la Puente et al. 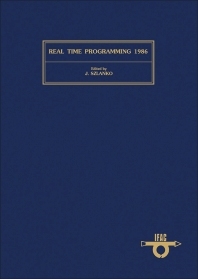 The 1986 IFAC/IFIP Workshop on real-time programming represents the 14th meeting of this workshop since it was first organized in 1971. Traditionally a meeting of a small number of experts, the papers presented at this meeting concentrate on the topics of real-time environment and executives, software development tools and languages, and special real-time applications. The continuing progress being made in this field of programming is amply reflected by the papers and should be of interest to anyone wishing to be kept up to date in the field. For all those working in the field of real-time programming.